A S U P P L E M E N T T O T H E W I N N I P E G F R E E P R E S S | S A T U R D A Y , M A Y 1 0 , 2 0 1 4 NATIONAL NURSING WEEK MAY 12 - 18, 2014 NURSING: A LEADING FORCE for CHANGE National Nursing Week is an opportunity to cele- brate the unsung heroes in our health-care system. Nurses may not get all the glory, but they do a lot of the heavy lifting in every area of care. "Nurses are well-educated individuals who have an impact on planning, the execution of clinical practice, and the health care of the population of Manitoba," says Cathy Rippin-Sisler, president of the College of Registered Nurses of Manitoba. "I'm not sure the public understands how broad- based a skill set nurses have. There's still a very narrow stereotype of what nursing is." National Nursing Week runs from May 12-18. The theme for the week is Nursing: A Leading Force for Change, and many members of the profession hope that some of the week's events and activities will help educate the public about the vital role of nurs- es in the health-care system. "Nurses impact patients' lives at various points in an individual's lifecycle, from birth to death," Rip- pin-Sisler says. "Nurses are involved in research, detailed planning, the administration of the health- care system and education. Nurses ensure that decisions made in clinical practice are evidence- based, and nurse practitioners play an important role in innovation. Four out of ﬁve executive ofﬁ- cers of our health regions have a nursing back- ground." Each year, the college salutes nurses in sev- eral areas of excellence at an awards banquet. This year's banquet is set for May 15. "Nurses are the professionals that are most prevalent across the health-care system, but they're just going about quietly doing their work," Rippin- Sisler says. "The awards banquet gives us the op- portunity to recognize excellence in a variety of set- tings." Christy Froese, president of the College of Li- censed Practical Nurses of Manitoba (CLPNM), says the role of nurses has expanded and grown more complex over the years. The college is holding an open house on May 15 to give the general public an opportunity to learn more about the work of LPNs. "Nursing Week is still a public education program that deﬁnitely needs to be in place. There's not a great understanding of the role of the LPN. There's still a lot of education that needs to happen," Fro- ese says. 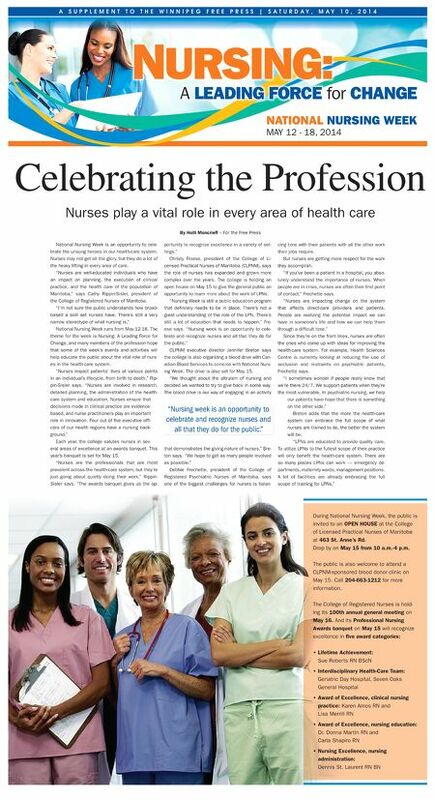 "Nursing week is an opportunity to cele- brate and recognize nurses and all that they do for the public." CLPNM executive director Jennifer Breton says the college is also organizing a blood drive with Can- adian Blood Services to coincide with National Nurs- ing Week. The drive is also set for May 15. "We thought about the altruism of nursing and decided we wanted to try to give back in some way. The blood drive is our way of engaging in an activity that demonstrates the giving nature of nurses," Bre- ton says. "We hope to get as many people involved as possible." Debbie Frechette, president of the College of Registered Psychiatric Nurses of Manitoba, says one of the biggest challenges for nurses is balan- cing time with their patients with all the other work their jobs require. But nurses are getting more respect for the work they accomplish. "If you've been a patient in a hospital, you abso- lutely understand the importance of nurses. When people are in crisis, nurses are often their ﬁrst point of contact," Frechette says. "Nurses are impacting change on the system that affects direct-care providers and patients. People are realizing the potential impact we can have in someone's life and how we can help them through a difﬁcult time." Since they're on the front lines, nurses are often the ones who come up with ideas for improving the health-care system. For example, Health Sciences Centre is currently looking at reducing the use of seclusion and restraints on psychiatric patients, Frechette says. "I sometimes wonder if people really know that we're there 24/7. We support patients when they're the most vulnerable. In psychiatric nursing, we help our patients have hope that there is something on the other side." Breton adds that the more the health-care system can embrace the full scope of what nurses are trained to do, the better the system will be. "LPNs are educated to provide quality care. To utilize LPNs to the fullest scope of their practice will only beneﬁt the health-care system. There are so many places LPNs can work — emergency de- partments, maternity wards, management positions. A lot of facilities are already embracing the full scope of training for LPNs." Celebrating the Profession Nurses play a vital role in every area of health care During National Nursing Week, the public is invited to an OPEN HOUSE at the College of Licensed Practical Nurses of Manitoba at 463 St. Anne's Rd. Drop by on May 15 from 10 a.m.-4 p.m. The public is also welcome to attend a CLPNM-sponsored blood donor clinic on May 15. Call 204-663-1212 for more information. The College of Registered Nurses is hold- ing its 100th annual general meeting on May 16. And its Professional Nursing Awards banquet on May 15 will recognize excellence in ﬁve award categories: • Lifetime Achievement: Sue Roberts RN BScN • Interdisciplinary Health-Care Team: Geriatric Day Hospital, Seven Oaks General Hospital • Award of Excellence, clinical nursing practice: Karen Amos RN and Lisa Merrill RN • Award of Excellence, nursing education: Dr. Donna Martin RN and Carla Shapiro RN • Nursing Excellence, nursing administration: Dennis St. Laurent RN BN By Holli Moncrieff – For the Free Press "Nursing week is an opportunity to celebrate and recognize nurses and all that they do for the public."